Exhibition Dates: September 6–30, 2017. 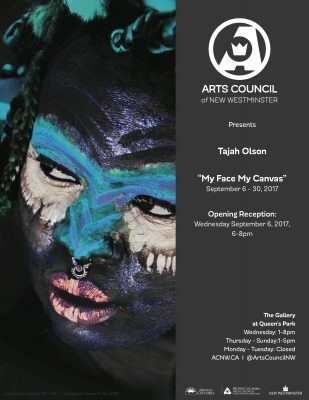 The Gallery at Queen’s Park presents Tajah Olson’s solo-exhibition, My Face My Canvas. Olson’s artistic practice is based in the embodiment of various constructed personas or animas, expressed visually through dressing and painting her own body. Olson physically re-enacts movements and feelings from memories and social observations, formulating her characters and painting process. The result of this mark-making through gesture creates the imagery and patterning seen on her body in her photographs. Through the use of escapism within her performances, Olson isolates herself and her subjects from place. She states, “I am a queen, a goddess, a warrior, I am a king, I am white, green, black, I am a spirit, a man, a child, a woman, I am a movement, I am feeling, I am a celebration and anything that I choose to be, even if it does not exist in this world.” Through this process, Olson transcends the physical and social constructs of identity, race, ethnicity and gender. With the aim of aesthetic appreciation of her constructed image, and detachment from the history and language carried within the colour of her skin, Olson addresses her experience as a racial and ethnic Other within western culture, and reflects on her identity and memories growing up in Malawi. Fatima Tajah Olson was born and raised in Malawi (Southern Eastern Africa) and moved to Namibia when she was fourteen years old where she attended Windhoek International School. She left the country when she was seventeen and moved to Victoria, BC and finishing high school at Victoria High School. After Victoria High School, Olson attended Pacific Design Academy where she studied Fashion Design, receiving a Fashion Design Diploma. She moved to Vancouver in 2005 and studied at Emily Carr University, receiving a Bachelor in Fine Arts. After graduating, Olson returned to South Africa and back to Malawi where she spent time volunteering with AIDS orphans at a clinic, various orphanages, and a school in a village. Back in Vancouver, Olson teaches African Street Dance to children and adults. In 2011 she was featured on Canada’s Got Talent, and in 2014 she choreographed an African dance for the Kindness Rocks Concert that involved 60 high school students. Olson continues to extend her volunteer efforts at events that help the homeless, assisting in music therapy sessions at a senior home, and African event programs.